I have recently returned to my Ashford Country Spinner 2 wheel and decided to spin some rather fine singles on it. I know that “they” say you can’t do that but I decided “they” were wrong. It is a bobbin led wheel and as long as I take my time, I can put in enough twist and make a rather fine single. I find when spinning on a slower bobbin led wheel as this, that the method of spinning is more important if you wish for a single that is thinner and not of bulky weight. 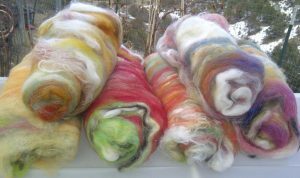 I carded up some art batts full of merino, silk, milk protein, Angelica, hand painted rovings, Cheviot and other various wools. I blended these batts years ago with the thought to weave 3 different sweater coats. I spun some of them at that time on the old Ashford Country Spinner and plied them up into a 2 ply. Those yarns are waiting to be added to this yarn I am making. Here is a photo of some of the art batts. I thought they were just yummy. I have been using a modified backwards long draft. By modified, I don’t take it up and way back with my shoulder and arm….that is way to painful. I keep my elbow snug in to my waist, and instead bring the yarn out straight from the orifice, loop it 90 degrees around an index finger on my left hand and let the twist build up between that position and my right hand drafting backwards out to the side. It is the best that I can ever hope to do for a backward long draft with the mechanics of my shoulder and neck. It works and I can get going lickety split as well as I get such fine singles that if I am not careful they draft down to thread and break. I have been seeing finer spinning out of me using this method in the last few months that I have ever produced in the last 12 years put together. I know that I said I would NEVER spin fine…but I changed my mind…get over it.! bwhhaaaaa…. “They” also said that you can put 2-2.2 pounds of fiber on that huge bobbin but again…..”they” were wrong. I weighed my bobbin and it was 2.4 pds of fiber on it and it was NOT full. I would need to buy a third bobbin if I plan to spin with the CS2 frequently, as winding that yarn of onto other bobbins to be able to ply it, is rather tedious. 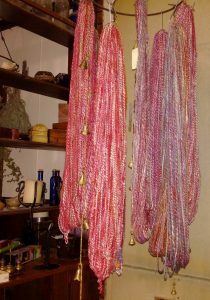 I spiral plied some of the yarn with a mill spun fine 3 ply that I hand dyed…..about 1200 yards of that. The rest of the yarn, I plied back with more of the same single to make a lovely 2 ply. I didn’t necessarily ply that in a spiral like the other yarns and did end up with well over 450 yds of that as well. I believe that I preferred the 2 ply to the 4 ply spiral. I have a lot of this yarn that I spun up and plied into a 2 ply years ago on the regular Country Spinner. That yarn is much thicker yarn but can still be combined with these yarns. They were all meant for 1-3 woven jackets that I had planned. I think I will still make a sweater coat jacket of some variety with these but I do not know if I will be weaving it. To get the movement that I want and the feel that I want, I think I may use Tunisian Crochet instead. 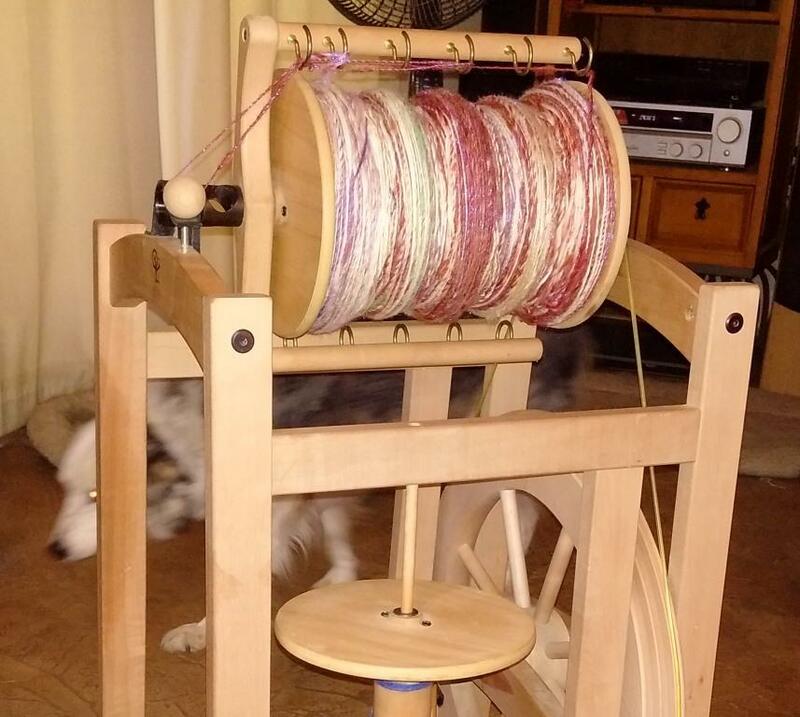 Altogether, I did enjoy spinning on the Country Spinner 2 again as a regular wheel versus using it for a plying wheel or for art yarns. 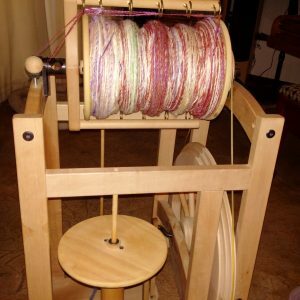 I did lament that it was so slow at the top speed of 5:1 and wished it had a few speeds higher, but during this spinning marathon of several weeks I did realize that I truly do prefer a bobbin led wheel. And I prefer a wheel with a large bobbin that I don’t have to stop and change out all the time. I prefer not having to fiddle with Scotch tensioning and all sorts of other adjustments that just slow me down. Your Plied Yarns look really good.